This post was originally published in Christopher Page’s blog, In A Spacious Place (#2 and #3). 1. Kataphatic – prayer using forms. Prayer which relies on the faculties = reason/ intellect, memory, emotions, will, imagination – all the things that tie us to our usual mind and our usual sense of self. Reinforces your kataphatic self, your ordinary awareness, your usual psychological sense of who you are and what you are all about. 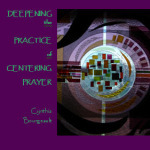 Centering Prayer (CP) = apophatic prayer. Every mistake we get into in CP is a result of trying to bring a little kataphatic into CP. We get the idea we are supposed to use our silence to hear God who can only speak in a whisper. In fact the silence is its own reality. It is reality listening at a more subtle level. No matter what can be gained by taking the hook of mystical experience, it is not worth the price. The ego abhors a vacuum which it perceives as emptiness and loss of control. So it will keep trying to seduce you back into the kataphatic realm which is its natural realm. What do we gain by staying with the apophatic? The ego always feels under nourished. There isn’t enough, it doesn’t have it yet, it’s not quite safe, it isn’t there yet. That is built into the nature of egoic consciousness. Egoic nature is founded in scarcity. It is founded in a way the mind works which splits the world into subject and object, into God and me, into other and self. And so you’re always feeling cut off. This is the anatomy of the mind = how the brain works. As long as you are perceiving in subject/object polarity, you will perceive lack, cut off from the whole and you will believe the goal of the trip is to get yourself back to the whole. And you always feel that others have more. And you always feel you’re wounded. Everybody feels less than they could be. It is built into the thought structure of that thing you want so badly – your perfect ego. You can’t have it that way. The first thing God does for most of us on the spiritual journey is to drench us in goodness and sweetness. We feel whole; we feel like we’ve finally been allowed to come in out of the cold. This is an immature phase of the spiritual journey. When you are starting with egoic consciousness, you need it. But it becomes a crutch which is a wonderful thing when you have a broken leg. But when you are healed, a crutch just slows you down. So what happens is that God gradually or sometimes swiftly removes the crutch. And if you’ve been using your spiritual practice for spiritual materialism, what you do is you get plunged down into the dark nights. All of a sudden you sit down and there are no consolations. Instead your skin is crawling. This is a sign of progress. So don’t get hooked in the first place. Rather than grabbing on, you let go. As long as the mind grabs, you are patterning materialism. Instead in CP we pattern letting go so deeply and so profoundly that you wouldn’t even think of anything else.